Opening Thoughts:I just successfully wasted about 6 hours over the last two nights on writing this post only to erase it both times and start over again. I’m starting to think that it’s important, either that or God is just working on my patience and obedience. The Long Hair: I remember when I was a kid, likely about 12 years old, I was hanging out with some school mates and I noticed that one of the girls had a very long hair on her forehead. I told her about it and reached to pull it out and to my horror it was attached! She was horrified as well and I think she ran to the bathroom to pull it out. My first thought was, “A hair like that does not grow over night, how on earth did it get that long without her noticing it? I thought, “It literally must have taken months.” She was the kind of girl that spent enough time in the mirror so it was kind of funny she overlooked it all those hours grooming. It took someone else to make her aware, then when she saw it, she could hardly believe how she did not notice it before. Overlooking The Obvious: In the passage we are about to read Jesus is speaking with the crowds about true Salvation, the only issue is these people thought they were okay! There’s nothing harder than sharing the gospel with someone who has been schooled by religion their whole lives, gone to church, came from a Christian home, maybe went to a Christian school, read enough of their Bibles to get by, prayed a prayer, baptized in water, and have sat under hundreds of sermons over the course of their life. It’s much easier to share the Gospel with people who don’t profess salvation, who when you point them to the law of God and how they have violated it, they admit to being guilty. The church goer is a much harder nut to crack because many times they see themselves as A-okay since they prayed and asked Jesus into their heart once, if not several times in their lives. Just like these Jews were blind to their need of the Savior because they were born from the line of Abraham, many people (not all) who have prayed a prayer have been immunized to the Biblical Gospel, which is a very dangerous place to be in because most times there is no concern of further evaluation. Paul says to examine ourselves to see if we’re in the faith 2 Corinthians 13:5. If there was no way that you could be falsely saved Paul wasted his breath, likewise Jesus also would have wasted His breath in the well known passage Matthew 7:21-23. So in light of those passages let’s jump into tonight’s text. Luke 11:29-36 ESV … When the crowds were increasing, he began to say, “This generation is an evil generation. It seeks for a sign, but no sign will be given to it except the sign of Jonah. For as Jonah became a sign to the people of Nineveh, so will the Son of Man be to this generation. The queen of the South will rise up at the judgment with the men of this generation and condemn them, for she came from the ends of the earth to hear the wisdom of Solomon, and behold, something greater than Solomon is here. The men of Nineveh will rise up at the judgment with this generation and condemn it, for they repented at the preaching of Jonah, and behold, something greater than Jonah is here. Large Numbers: It’s interesting that we have so much emphasis today on “Church Growth”. Do a Google search on that and check out what kind of methods are used. You’ll find suggestions like, better songs, beefier sound system, take the Cross down and put more social justice type themes up (which many have done), teach more of a “you deserve it, Jesus is the answer to your problems” style message, remove the word church and call it a campus. We do BBQ’s and church preschools, community events so that as a church we are painted in a nice light. Much of what we do is an effort to make people feel warm and fuzzy thoughts about Christians and maybe they’ll want to pray a prayer and become a Christian too. They’ll join the coolest church in town and help recruit more people who will hopefully become tithers to help pay for the annual budget. I’m not saying that all the things that are done in church today are wrong, but we have to ask ourselves “why do we do them”? Jesus Isn’t Interested in the Latest Church Growth Methods: Let’s take a look at how Jesus handles large crowds. “When the crowds were increasing, he began to say, “This generation is an evil generation. It seeks for a sign, but no sign will be given to it except the sign of Jonah.” WOW, I think it’s safe to say that Jesus would be kicked out of many of today’s churches. Jesus’ crowds were anywhere from 5,000 – 30,000. We see this when He fed the 5,000 men (not including women and children). All of these people belonged to their local synagogues, they worshiped the God of Abraham, and they were taught by their local Pharisee’s, Scribes and Leaders. Jesus takes His meetings straight to the outdoors and tells all of these same people that they are Evil, and that they were Sign Seekers. It’s no secret that there are many mega churches today that focus on a Health-Wealth and Prosperity gospel. They quote scriptures seriously out of context and they gather large crowds to themselves. One such church has thousands of world-wide visitors weekly, all people who are seeking that type of luxurious lifestyle. They love hearing how God is their genie and He wants them to be wealthy. Can you imagine what would happen if Jesus showed up today and drew 30,000 out of their churches and told them that they were evil sign-seekers. Then found the poorest person in the building and said that He valued the amount they gave over the wealthiest who gave thousands! Something tells me that these pastors wouldn’t take that lying down. Neither did the Pharisees in Jesus day, they were right on top of it setting traps for Him, but they could never catch Him. Jesus was concerned for the souls of people, not about building a large physical church, filling it up and training them to tithe. His methods were purely kingdom focused and His message went straight to the heart. Sign Seekers: There are many ways people seek signs nowadays. One of the ways is the sign of prosperity. Many churches preach that God owes you if you give your tithe and that if you don’t cheat God on one single penny then you will be blessed 100 times over so that your barns can’t contain it. I’ve seen hundreds of people show up for seminars held in churches to teach the principle of sowing and reaping and how people will reap financial rewards from the money they sow. I’ve seen pastors read letters of how people that gave had supernatural debt cancellation! People just drink this stuff up. I’ve also seen seminars for evangelism held in the same churches with about 10 people showing up. The harvest of souls is the most important return on investment yet so few are interested in that. Sign seekers are interested in what God can do for them in addition to the Cross… Seriously, isn’t it enough that the God of the universe humbled Himself and came to earth to be crucified in your place? But you say, “I want to see more”..
That’s exactly what the people in Jesus day wanted to see, more signs. They were looking for physical liberation from their current oppression. They had been ruled over harshly and they were seeking a liberator to join forces with them and destroy their enemies, this is how they had interpreted the scriptures of old. But when He showed up and spoke about their sin instead, they got mad, in fact furious. How many of us, sing songs on Sunday declaring that Jesus is all we want, then we open our mouths to pray and out come all the requests and sometimes demands. If we are truly grateful and satisfied alone in salvation we should be praying how Jesus taught us to pray in the “Lord’s Prayer“. To truly get a glimpse of the Cross of Jesus Christ is to seek nothing more from Him except His kingdom and His righteousness, Matthew 6:33 – But seek first the kingdom of God and His righteousness, and all these things will be added to you“, not the other way around.”But seek first all these things and the kingdom of God and His righteousness will be added to you”. The Only Sign You Will Get: Not sure about you, but when I was a kid I remember my parents using this phrase with me a lot “The only thing you’re going to get is …. a spanking” … This was not usually what I had in mind. They would often say that when I wasn’t listening and I was continuing to ask for things which I had been told “NO” to several times. I was seeking the wrong things and I needed to be corrected. In this part of the text where Jesus is telling the crowd about the only sign they are going to receive, He’s responding to vs. 16 “while others, to test him, kept seeking from him a sign from heaven“. Jesus knows their thoughts and says “The only sign you’re going to get is ….. the sign of Jonah. For as Jonah became a sign to the people of Nineveh, so will the Son of Man be to this generation.” So if Jesus is directly comparing Himself to Jonah.. what do we know about Jonah and Nineveh? It’s almost a pity that we have made that story into a children’s bedtime routine. The story of Jonah is a message of the Gospel. It’s a beautiful story of God making a people His own by sending a messenger with a warning of repentance. Their response was redemption for the city. Jonah 3 ESV … Then the word of the LORD came to Jonah the second time, saying, “Arise, go to Nineveh, that great city, and call out against it the message that I tell you.” So Jonah arose and went to Nineveh, according to the word of the LORD. Now Nineveh was an exceedingly great city, three days’ journey in breadth. Jonah began to go into the city, going a day’s journey. And he called out, “Yet forty days, and Nineveh shall be overthrown!” And the people of Nineveh believed God. They called for a fast and put on sackcloth, from the greatest of them to the least of them. The word reached the king of Nineveh, and he arose from his throne, removed his robe, covered himself with sackcloth, and sat in ashes. And he issued a proclamation and published through Nineveh, “By the decree of the king and his nobles: Let neither man nor beast, herd nor flock, taste anything. Let them not feed or drink water, but let man and beast be covered with sackcloth, and let them call out mightily to God. Let everyone turn from his evil way and from the violence that is in his hands. Who knows? God may turn and relent and turn from his fierce anger, so that we may not perish.” When God saw what they did, how they turned from their evil way, God relented of the disaster that he had said he would do to them, and he did not do it. Jesus Was A Warning to Repent: Jesus comparing Himself to Jonah truly reveals the message He was preaching. God sent Jesus (a willing Servant) into the world, unlike Jonah who was an unwilling servant, to call people to repentance. He was warning them, and us, of the wrath to come just like Jonah was to the Ninevites. God is calling a people to Himself to heed His words and turn from their wicked ways. Jesus wasn’t just a little man with a quiet voice who went around patting babies on the head and loved to hang out with sinners… The reason He hung out with sinners was to call them to repentance. Jesus did everything with the Kingdom in the front of His mind. Final Thoughts: Have you heeded the call of Jesus to repent and turn away from your sin; have all your needs been met in Him? Have you been seeking God for more signs from heaven, desiring things that are of no eternal value? I will be talking tomorrow about how there are so many people in the church who think they are on the right path, but they are literally blind… the issue is that no one has ever told them they are blind before. 1. How have you put God to the test? 2. Are you seeking after God only? 3. How does Jesus comparing Himself to Jonah affect you? 4. Just like the girl in the story I told who had over looked this hair for so long, what things have you overlooked in your life? 5. 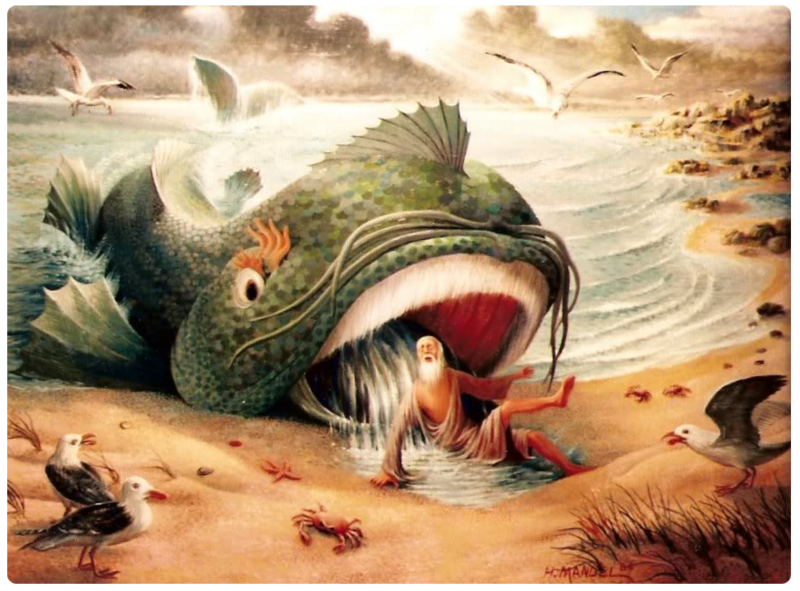 Read the book of Jonah Chapters 1-4 and see how God cares enough to send a man to warn a city to repent. Then see how Jesus is that man to us, except much greater than Jonah, He is the one who offers the hope as well. Great post Shane! Just had to re-post! Thanks David… Lord Bless you and thanks for the report.